For those of you artists that keep wish lists handy, here are some of our most popular and most versatile brushes and where to buy them. Pass this list along to your loved ones or "Pin" it for them to find. Enjoy your holiday season and make time to paint! Back in September, I announced that we would be giving away free brush canisters to art educators from a drawing of lesson plans sent our way. Our winner is Mindy Dember from Plano, Texas!! Mindy Dember is an ART Specialist at Daffron Elementary in Plano, Texas. She has shared this wonderful lesson plan with us and given us permission to reprint. Working in a group, the student will identify with an ARTIST and recognize the subject matter and style of their work. They will draw a still life in the style of their artist, filling their paper to create a balanced composition. Next, by cutting and trading, they will paint 4 pieces; two pieces warm and two cool. They will then tape their original drawing back together to create a cubist style warm/cool still life. Divide students into groups of 4, if possible. Three if you have an uneven amount of kids. Assign each student an ARTIST to look at, either using post cards or letting them use an ART EVERYWHERE book. You could put ARTIST’s names in a bucket for them to choose (each name can be chosen 4 times). This will determine who they will paint with. Or just let them choose their own from a list you give them. After they decide on one ARTIST, they are to draw a still life with their ARTIST as inspiration. Pass out a 12” x 18” sheet of white watercolor or construction paper. They will each do a drawing and get a grade for composition. As a group, they will set up a still life at their table together to draw. Each student will sharpie their pencil lines and then erase any pencil lines showing. Each student should end up with 4 pieces to paint. Tell them to paint 2 with warm colors and 2 will with cool colors. After they finish painting their parts, return the pieces to the original artist and match the pieces like a puzzle, and then tape them together on the back. 1. What do you see? 2. Can you name elements or principles of ART that are the same? 3. Can you name elements or principles of ART that are different? 4. What style did the ARTIST paint in? 5. What techniques does the ARTIST use? 6. 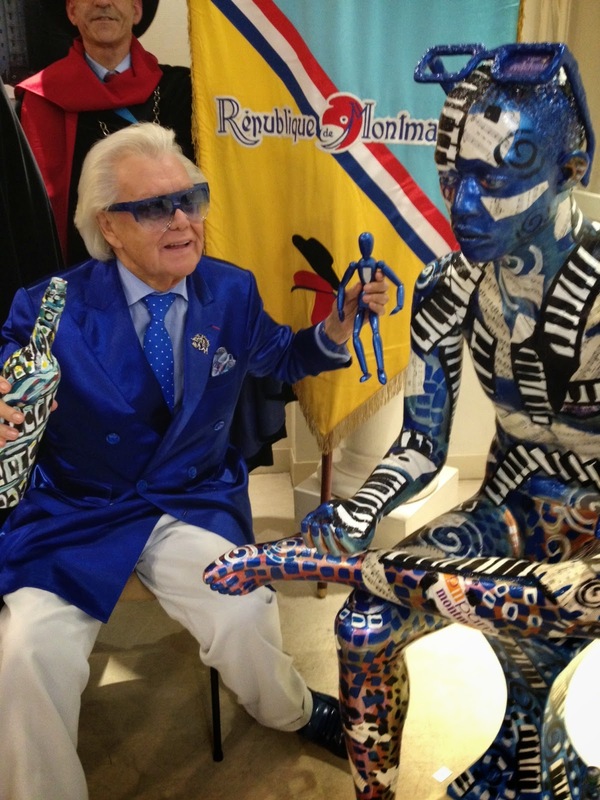 What other information did you learn about your ARTIST? we wish you a Happy Thanksgiving. Celebrate wherever and with whomever you can, and maybe get a little painting in! New Retailer AOE is carrying Dynasty Brushes! A big WELCOME to AOE Supply in Tampa, Florida! We are glad to have AOE as a new retailer in Florida, carrying several of our brush lines, including Urban FX, which is great for outdoor mural work. They are also carrying Black silver, Micron, and our fine kolinsky. 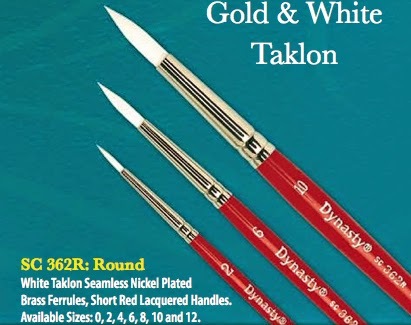 This is a great range, giving any artist's style and budget a chance to try our brushes. 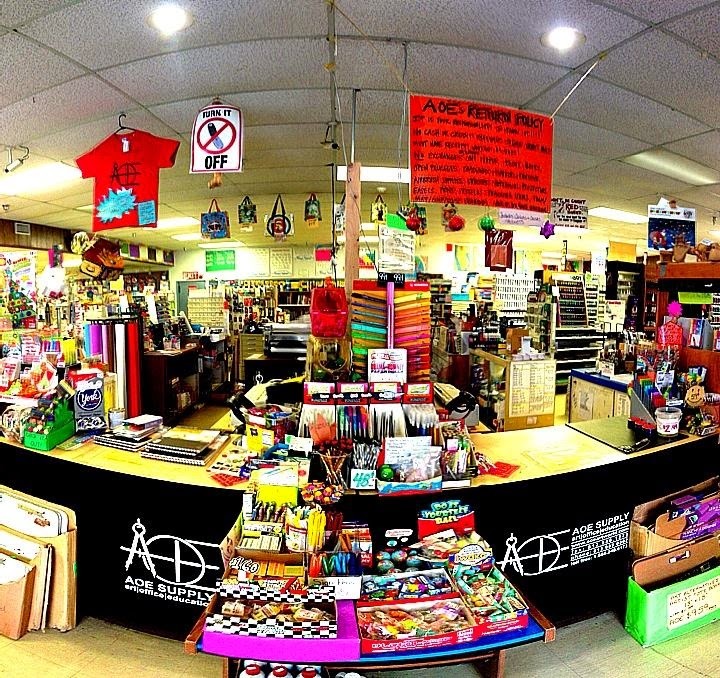 AOE (Art, Office & Education) has been in business since 1975 and they carry a huge line of products both in store and online. You can see a glimpse of their stock on their Facebook page or on their website: www.aoeartworld.com They also have a large resource bank on their website of art workshops, events and museums in the Tampa Area. Thank you to AOE for joining our retailer group; we look forward to many years of working together. 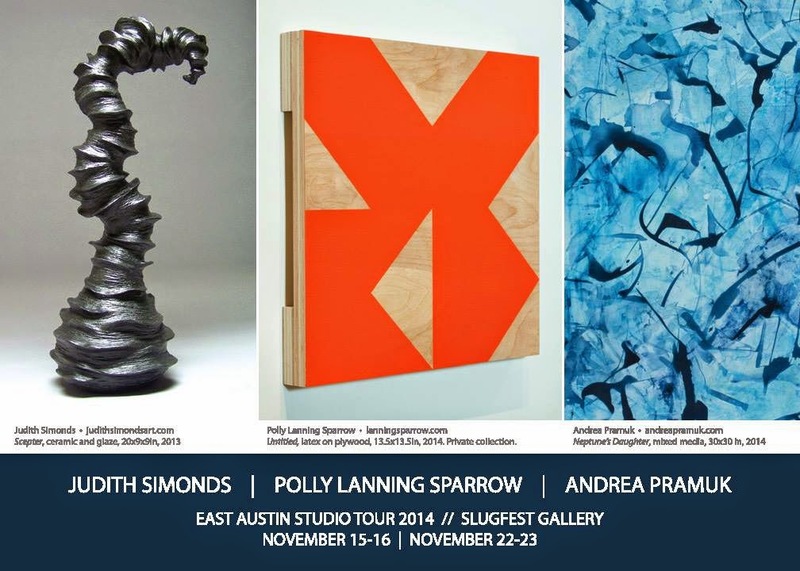 Austin artist, Andrea Pramuk has an exhibit in the upcoming EAST studio tour at Slugfest Printmaking Workshop and Gallery over two November weekends featuring her mixed media work on panel. She is exhibiting alongside artists Judith Simonds and Polly Lanning Sparrow. The EAST Studio Tour is a free, self guided event showcasing Artists & Studios, Exhibitions, Happenings, and Select Events. Artists & Studios and Exhibitions are free to the public and open on the weekends of Nov 15-16 & 22-23 from 11am - 6pm. "The Philadelphia Watercolor Society was thrilled to distribute brushes to everyone attending their 1st annual workshop. The workshop was held at the PWCS 114th Anniversary International Exhibit at the Community Arts Center in Wallingford, Pennsylvania. Being our first workshop, PWCS is extremely grateful to Dynasty Brush for helping us encourage registration by giving away brushes to our all of our attendees! Dynasty generous sent us a box of the Orange Ice synthetic brushes, in their largest size – the #24 round. They choose this brush to send us after perusing the website of the workshop instructor, Sarah Yeoman, and watching her YouTube videos of her paintings. According to her materials list, Sarah prefers working with large round brushes, making this brush a perfect accompaniment to her lessons. The Orange Ice holds it’s shape and maintains a fine point while holding extremely large quantity of water, and is an ideal brush for watercolor painting. The synthetic bristles are soft and yet it has wonderful spring, closely mimicking the performance of natural Kolinsky brushes. The brush is primarily marketed for use with acrylic paints, but it really out performs when used with watercolors. The fine point allows for precise paintings of details, and the large capacity of the body holds a large reservoir of fluid. This makes the brush perfect for all types of watercolor painting, and allows for easy transitions for artists painting either loose or tight. Everyone loved their new brush from Dynasty, and could hardly wait to start painting with it. Our workshop was quite a success, and our participants were thrilled to come away from it with a marvelous free gift in addition to the wonderful instruction. 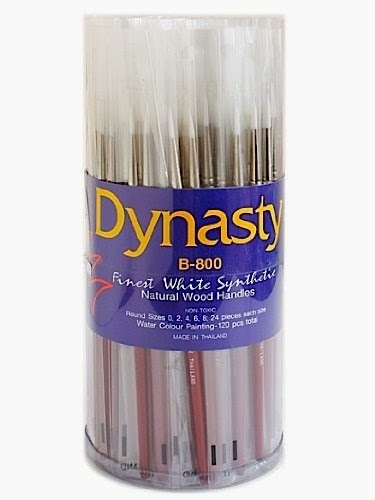 New Retailer Cheap Joe's is now offering Dynasty Brushes!! Welcome to our Dynasty Brush Family Cheap Joe's! 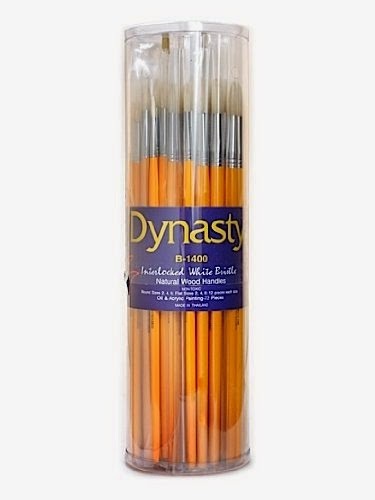 One of our long time friends and one of the most respected art material dealers and art resources in the country is now carrying the Dynasty Brush lines in their stores in Boone and Charlotte, North Carolina. Cheap Joe's has been a leader in the art material industry with a huge selection of supplies as well as instructional resources for artists, now including a blog, workshops and a well stocked YouTube channel. Cheap Joe's will be carrying Black Steel, Faux Squirrel, Interlocked Bronze, Black Silver and Micron lines in their stores. Take a trip to the beautiful mountains of North Carolina and stop at Cheap Joe's to find your favorite brushes, or call and sign up to receive their catalogue. Cheap Joe's ships internationally, too! The modern artist has many supports or substrates to choose from, most painters choose from canvas, wood panels or paper depending on their medium. In all substrates, there is a huge range of quality. Pre-made canvases and panels can be convenient, but may also be created with poor quality ingredients. Research the companies and materials that go into your artist materials. There are many reputable and well made substrates on the market, and paying for a quality support will make the difference in the longevity of the piece. Canvas, meaning tightly woven cloth, is a flexible, light-weight support. Cotton, linen or synthetic fabric is sold in rolls or already pre-stretched on stretcher bars. Canvas usually needs to be sized and primed before it is ready for paint. Canvas can be stretched to large sizes without the weight that accompanies panels or it can be rolled for easy transport. Keep in mind that canvas does move and flex with humidity and temperature and can cause cracking in a painting depending on the flexibility of the paint. Panel is the heaviest but most durable support. It can withstand layers of acrylic or oil paint that would weigh down canvas, yet panels are rigid supports made of wood, fiberboard or a combination. Not all panels are created equal. Wood also expands and changes with temperature and humidity, so it is vital to know what kind of manufacturing process is the most resilient against warping and the best to hold paint. Panels need to be sealed and primed before paint is applied. There are plenty of good panels on the market that are pre-primed and ready for paint. Paper rarely needs to be primed for painting, however it can be unsuitable for oils due to the acidity of the paint and it can be fragile for heavy bodied acrylics. Paper is incredibly versatile and most easily available usually for working quickly, travel, sketching and mounting on other supports. For more information on choosing the right paper for your medium, check out Strathmore's Paper Media Guide. It should age without becoming so brittle or fragile that it will suffer from exhibition, handling, or proper storage. It should be able to withstand the effects of atmospheric changes. Under reasonably variable conditions of relative humidity (RH) and temperature, the support should expand, contract or warp as little as possible. It should have enough absorbency and tooth to provide a good key for the kinds of paints and grounds applied to it. I have barely begun to scratch the surface of modern supports. Take time to research and experiment. Some artists find what works for them breaks all the "rules" and others find that tradition is the best path. FM Brush, Inc. makes over 17, 000 kinds of brushes. With so many to choose from, it can be overwhelming for an artist to choose what kinds of brushes will work best for their media and styles of artwork. Below is a chart of the Dynasty professional artist brushes and their corresponding media. Traditionally artists used natural hair brushes for oil and watercolor with synthetic brushes mainly for acrylic paints. However, with the technology advancing quickly in synthetic fibers, synthetic hairs have the spring and support of natural hair brushes. Each artist should experiment with a range of brushes to know what works best for their style, comfort, and medium. These are solid brushes, intended for heavy body paints, with the interlocked design and a synthetic blend of hair, created in house. The hair is strong, springy and firm, like bristle brushes. Our master brush makers with no less than 20 years of experience put these together, all by hand from start to finish. Long black chrome Hollander ferrules are used, to insure good balance and permanent attachment to the handle. They are non-reflective and suitable for outdoor use, either plein air or mural work. The handles are precision balanced and completely manufactured in house by FM Brush. The matte steel grey finish that is applied to the handle is both non-toxic and water resistant (did I mention comfortable? ), and the brush top is triple bonded to the handle to insure long lasting performance. Black Steel comes in a variety of shapes and sizes including our patented wave shape design for special effects and landscape work. These are coming soon to stores near you! Jivan Lee, oil painter, is having a solo exhibition opening September 26, 2014 at Heinley Fine Arts in Taos, New Mexico. This year's exhibit will feature over thirty of Lee's newest pieces, continuing his exploration of paint as abstract, textural, colorful raw material and as vehicle for recognizable image. 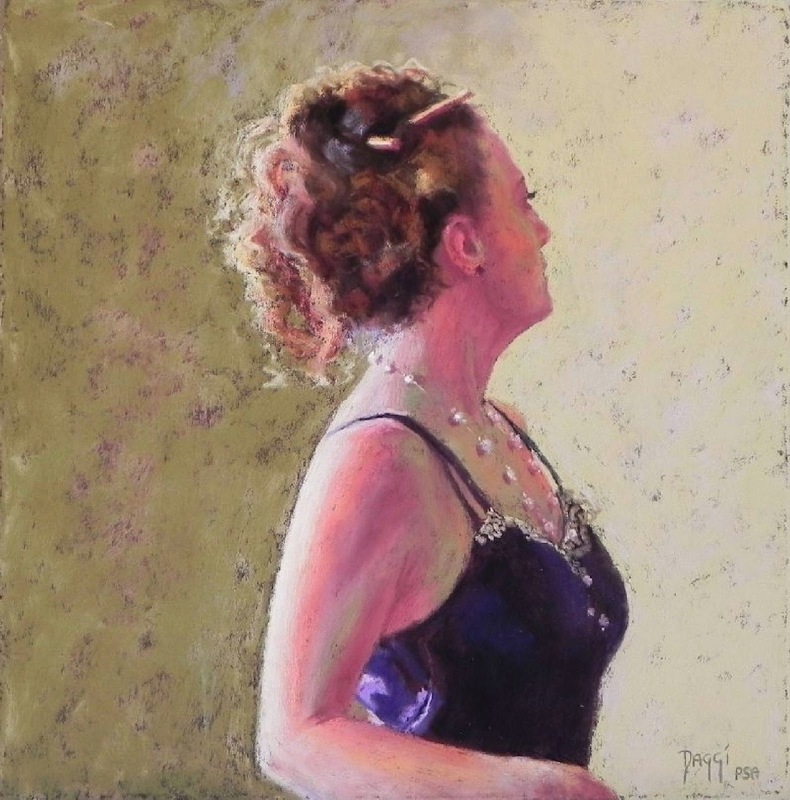 Daggi Wallace, pastel artist will have two pieces, Pearls and Reluctant Princess in the 28th Annual Open International Exhibition of the Pastel Society of the West Coast! The show runs from Oct 2-Nov 8, 2014 at the Art Center Morro Bay, CA. She will be at the reception and awards ceremony on Oct 12. Frank Serrano, landscape artist does workshops and demos regularly. He is giving a demo on October 25th in Santa Barbara. Follow his blog or find him on Facebook for more information. Artist, actor, businesswoman, mother and wife, Rosaleen Moriarty-Simmonds just hosted her first solo show this past August. After a full year of shows, demos and study, this was no small accomplishment for this UK based artist who was born without hands. 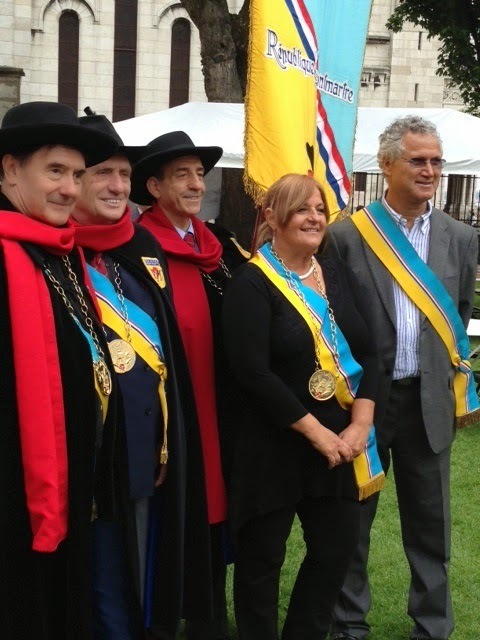 Rosie is a part of the MFPA (Mouth and Foot Painting Artists) . 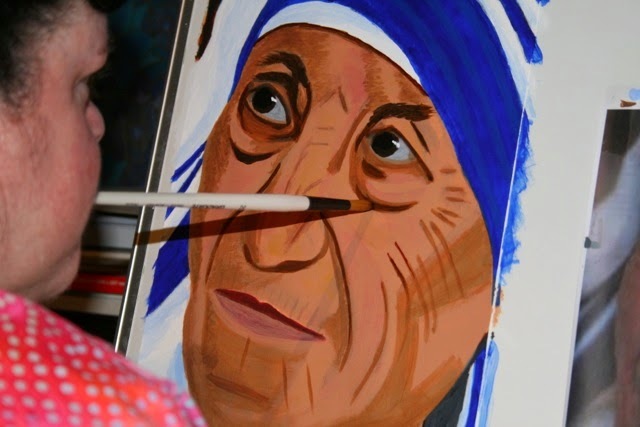 Each artist that is a part of the organization paints without the use of their hands due to disability, and Rosie is a mouth- painting artist. The organization teaches artists, gives scholarships and helps these artists sell their work as well as the many exhibitions, demonstrations and events they hold around the country. 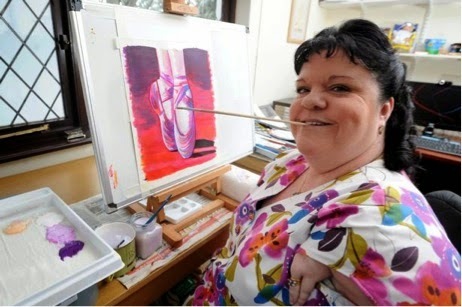 Since birth, Rosie has been disabled, so she has been used to writing and drawing with a tool in her mouth. Like many full time artists, Rosie has always had a love of creating art, and she learned to paint holding a brush in her mouth. Navigating her way through the higher education system, Rosie graduated with a degree and pursued work as a civil servant before starting her RMS Disability Issue consulting business. Art was still in her mind, even though it was the back burner while Rosie got married and started a family and worked her business. However, with the encouragement from a senior member of the MFPA, Rosie sent in a portfolio and was offered a scholarship as a student mouth painter. Rosie paints with acrylics, doing landscapes and still-lifes and some portraiture. She has mainly chosen her materials for the ease with which she can use them, trying watercolor, pastel and even ink. Since Rosie works close to her substrate, painting from her mouth, she has searched for long handled quality brushes. In her research, Rosie found Dynasty. She explains further, "I found it very difficult to source good quality long handled paintbrushes. In fact there was nowhere in the UK and after quite extensive research, I came across Jeff Mink at Dynasty Brush. I explained my situation and asked if I could purchase bespoke brushes from the company; Jeff went a step further and personally made me a whole set. I have never experienced such kindness from a stranger, and will always be eternally grateful to him." Jeff created a version of the Black Gold Wave brush for Rosie, adapting a smooth sanded plain wood handle. With her busy schedule, Rosie has been a part of many MFPA shows and demonstrations, including a show in South Wales this past May with the group. 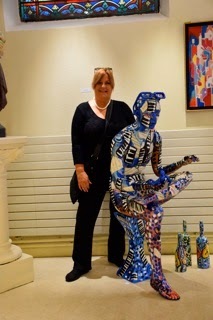 She also found time to host a solo show this August and displayed 44 of her works in her home garage. Over the next six months, Rosie will be in many more exhibits, including a demo at the National Museum for Wales on October 15th and a weekend in Eastbourne for more exhibitions. Next February, you can see Rosie giving a presentation at the South Wales Art Society, of which she is a member. To see more of Rosie's artwork, find her page on the MFPA website. You can read more about Rosie's business and her memoir through her website: www.rms-consultancy.co.uk. Enter our Art Educator Drawing to win some brushes! We are working hard to build our repository of lessons for art teachers as well as connect with art teachers around the country. Dynasty wants to know how you use paint brushes in the classroom and what kinds of brushes work for your projects. Calling all art instructors for grade school (US only for this drawing please): We are offering a chance to win a full canister of brushes from Dynasty to support your classroom. To enter the drawing, send me, Karyn, one of your lesson plans, marked with the age category and preferably a few illustrations/photos with your lesson. Age categories are as follows: Elementary (K-4), Middle (5-8) and High School(9-12). Please mark the suggested grade levels on your lesson. We will enter all the lessons into one pot for the drawing to win a canister of brushes. Three winners, one from each age category, will be selected to have their lessons posted on our website and blog, along with links to their classrooms and schools. Each winner will receive an age appropriate canister of brushes for their classroom. Once again, send your entry (a art lesson plan marked for the age) to me at my email address: karyn (@) dynastybrush.com. Good luck to all! Spread the word and get those entries in. The drawing will close November 14, 2014 and the winners announced by November 21st, 2014. As the back to school season is getting under way, I just wanted to share that Dynasty has some events under way this school year. We have partnered with Strathmore again this year to help out with their educational workshops this fall at college institutions around the country. Dynasty has donated white round watercolor brushes for the hands-on workshops, which demonstrate Strathmore paper products and their versatility. Artist and educator, Glenn Brill manages the educational program for Strathmore. As a supporter to Strathmore in art education, we are proud to share more about their excellent product line and the artists that use their papers. To find out more information, Strathmore has a wonderful blog and eNewsletter as well as some new products featured on their website. They also have online workshops, like "Watercolor sketching and Journaling," which you can register for and take for free at your own pace.